From 1999 to 2002, I wrote reviews of concerts and CDs of local artists in Western Massachusetts for Musc Review Magazine. No one can accuse Yusef Lateef of playing easy listening music or pandering to mainstream tastes. 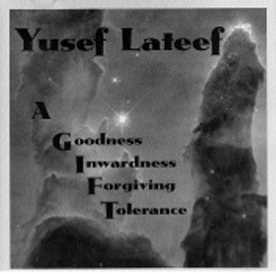 The music on “A GIFT - Goodness, Inwardness, Forgiving, Tolerance” is certainly challenging, for the musical collaborators as well as for listeners. But the inner logic and stark beauty of the music reveals itself over repeated listenings, like a lotus flower unfolding or light refracted within a multi-faceted jewel. As such, the music goes beyond jazz into the experimental, free-form, post-modern side of New Music. At times the compositions sound like what would happen if John Cage cut up some of Anthony Braxton’s more obscure notational symbols and threw them up into the ether, from where they were distilled into magical, thought-provoking music. On “Super Symmetry” drummer Sabir plays dense patterns while Lateef blows scaley riffs. While the instruments seem at first to be disconnected, stopping and starting in different places, the composition still hangs together. The musicians seem to be basing their playing on some obscure mathematical formula designed to create a higher state of consciousness that is only reached when they play straight from their physical, mental and spiritual selves to ours. Some pieces, like “Special Relativity,” offer fragmets of melody only to abandon them abruptly. Others like the lovely ballad “Logical Absurdity,” with its piano recalling Satie or Debussy and ultra smooth flute figures, use melody to invoke a deep reverie where strange, semi-grasped thoughts crystallize and disappear. “Entrophy” features some fast, modal guitar runs, deconstructed melodic fragments and percussive keyboard effects that could be inspired by early electronic music composer Edgar Varese or acid-jazz guitarist James “Blood” Ulmer. Likewise “Intersection” blends distant, oblique sounds over a subtle pulse that is at once free jazz and minimalist neo-classical. With over five decades of musical study and performance, and as a professor at UMass, Amherst, Yusef Lateef certainly enriches the musical life of the Pioneer Valley. His latest CD will enrich and enlighten the adventurous listener. Known locally for his virtuoso jamming with Tony Vacca's World Rhythms ensemble, bassist Joe Sallins showcases his awesome talent here as a jazz composer, pianist, drummer, arranger, and powerful creative force. Yes, he also plays some amazing bass and piccolo bass riffs. 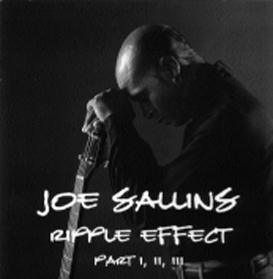 "Ripple Effect" is a two CD set that traces Sallins' musical evolution and synthesizes his influences, building like ripples on a pond, culminating in a musical tidal wave on his original compositions, particularly "Breathe, Smile, Play." Part I of "Ripple Effect" shows Sallins paying homage to the masters. He lays down some heavy bass on a roots-funk-fusion version of Horace Silver's "Song For My Father," deconstructs Duke's "Mood Indigo" with an inspired piano solo, does a fast but swinging version of Miles Davis' "All Blues," playing the theme on piccolo bass, then wrenching some wild and distorted riffs out of the instrument, a little like Joe Pass on acid. He gets solid support from drummer Rick Marshall, especially on the Sallins original "McCoy's Trane," which features more of Sallins' beautiful, flowing piano work. On Parts II and III Sallins stretches out even further. He combines swing and fusion on "Blinky, Blinky, Blues," playing drums, basses and keyboards. On "Power of One" Sallins raps over the percolating percussion of Tony Vacca's balafon and Massamba Diop's tama drum. "Millennium" has a great Return To Forever sound, with Sallins playing the Al DiMeola parts on piccolo bass. The influence of RTF and Chick Corea are very strong on "Ripple Effect." Sallins plays some Chick-like piano on the original "Mr. Smith" and sounds like Stanley Clarke on "Epic Mind." He also displays a little of the more annoying aspects of the fusion style on "The Romantic Dreamer Suite," which suffers from some cartoonish vocal effects and short, undeveloped sections. Where the RTF influence is most effective is on "Breathe, Smile, Play," a tour de force with some impossible and monstrous playing. The overdubbed piccolo basses and deep 7/4 groove are spine chilling, totally outcrunching the heaviest heavy metal, but with a jazz sensibility and positive vibe.